The Oscar winner for Best Foreign Language Film at the 2016 Academy Awards, Son of Saul beat some fierce competition for the prize, proving itself to be a Best among bests, a powerhouse foreign film among five deserving features. Embrace of the Serpent, the Colombian picture, was the title on everyone’s tongues, and A War, from Denmark, was one of the best movies I saw the entire year, regardless of language. In order win over the other nominees, Son of Saul not only needed to have a strong story but also a uniquely wonderful delivery, something stirring presented to us in a way we had never seen before. And that’s exactly what happened. Holocaust films might be a dime a dozen, given their inherent pull and undeniable emotion, but I have never seen that terrible period portrayed or shot in this way before, reinventing a genre that we falsely thought we’d seen in its entirety. Auschwitz, 1944. A group of strong male prisoners aid the Nazis in their grim mission to annihilate rebels, Jews, and other minority groups. Entire families of Germans, Hungarians, Poles, and man & women from across Europe make the journey to the famous death camp, never to be seen again. The “lucky” few who are chose to live slightly longer than average are called the Sonderkommando, and their job is truly the most terrible you can imagine. While old & young alike are being led to their deaths in the gas shower rooms, the Sonderkommando help them out of their clothes, never hinting at the disgusting end that awaits them once the doors are closed. After, these men remove the bodies, clean the walls, burn the remains, shovel the ashes, and then wait to do it all again tomorrow. In the face of the most debasing task that can be asked of them, aiding their enemies in the disposal of their countrymen & fellow Jew, the members of the Sonderkommando are faced with absolutely no choices. They know their shared fate, but can’t help hope for one more day, one more meal, even if this means the complete abandonment of morality. But while a small group of guerilla commanders plot an uprising before the workforce is thinned out, one man leaves his place in the cog; not to make a statement, not to show the Nazis that he will not abet such vile practices, but rather to bury one small, dead boy out of thousands. Convinced that this boy is his son, Auslander risks his life time after time to hide the body, find a rabbi, bury the dead, say the prayer, and make one tiny gesture of love in the face of colossal hate. To say that Son of Saul is an affecting drama would be like saying that Mt. Everest is high. In such cases, words fail to encompass the scope of the physical, falling short in their descriptions because, after all, words are only representations, and no representation can replace actual experience. 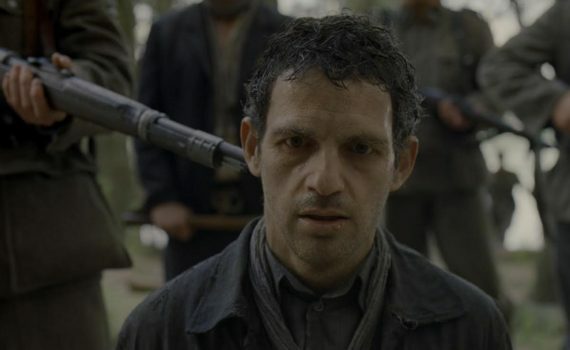 Son of Saul is the type of movie that forces you, rather than asks you, to share in an awful experience that will bring you as sickeningly close to the reality of the horror of this time as you could possible reach. We’ve read about the concentration camps, heard the sad stories, been brought to tears by such films as Schindler’s List, The Pianist, and The Boy in the Striped Pajamas. 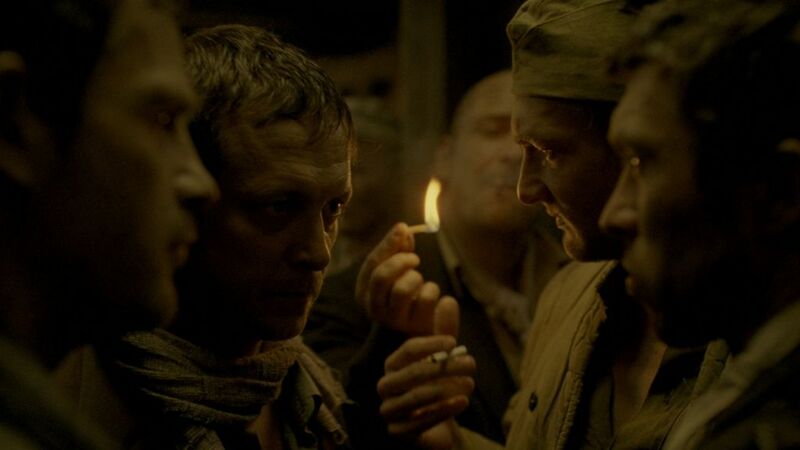 But not until Son of Saul have we been thrust into the smoke and made to breathe the air, to stand alongside those who have minutes to live and both feel their pain & watch their pain be completely ignored. Not just another Holocaust plot, this film is a portal for our terror. Auslander acts as an avatar, our guide, the grim reaper of the camp along with his Sonderkommando mates. They do the tasks that nightmares are made of, cloths over their faces to mask the stench, hearts hardened out of pure necessity. They are mere prisoners themselves, and yet their “privilege” is their shame, a shame that we feel in every scene. The cinematography is such that we follow the main character wherever he goes, on a bumpy ride through every level of the camp, watching these men at work and their commanders at play. You literally can’t escape without closing your eyes, and when Auslander attempts to give the final rite to a corpse he views as his son, we see the desperation for something kind in a place that knows nothing but evil. Brutal and difficult to watch as it is, Son of Saul is also powerfully undeniable, a stunning one hundred minutes. Video – With an aspect ratio of 1.35:1 (1080p HD) and shot using Arricam LT & Arriflex 235 cameras with Zeiss Master Prime lenses, the video quality of the Blu-ray disc is not what you watch this film for. The picture actually doesn’t stretch to fill in a widescreen format TV, keeping the black sides and that near-square picture box in the middle. The clarity of the picture is fine, but it’s the cinematography that will stun you. Matyas Erdely follows Auslander around in a manner that perhaps we’ve seen attempted before, but never executed to this level of perfection. Audio – The Blu-ray was done in Hungarian 5.1 DTS-HD Master Audio, with an option of English Audio Descriptive Track 5.1 Dolby Digital. Also, subtitles are available in English, English SDH, French, Portuguese, and Spanish. The sound of the film is haunting, with background screams & commands that inhabit far too many scenes for comfort, becoming a gruesome soundtrack to a film that’s already hard to watch. Extras – There are many excellent special features available on this Blu-ray disc. Commentary with Laszlo Nemes, Geza Rohrig, and Matyas Erdely can be activated prior to watching the film. One Deleted Scene is accessible: Return from the River, a 2-minute addition in which Auslander’s company comes across another prison group. Q&A at the Museum of Tolerance is an hour of interviews with director, star, and cinematographer. And there are seven trailers in all: Son of Saul, Labyrinth of Lies, Coming Home, The Lady in the Van, I Saw the Light, Dark Horse, Miles Ahead. Highly Recommended. 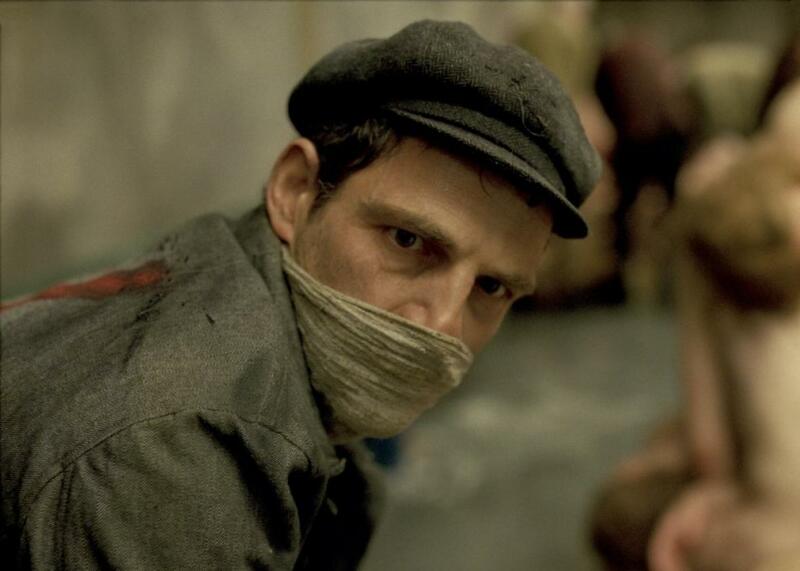 Among such strong nominees, Son of Saul is a completely deserving award-winner. With this film, it is not just about the content, a topic that anyone could take and wrench an emotional story out of. To become something truly & independently great, audiences need to see or feel something original & moving, which is exactly what we were given. This is the Holocaust reenacted like we’ve never seen before, shot with a method that has never been successful on this level, and remembered for the brutality & subtle bravery that was so intrinsic to the time. The video & audio of this Blu-ray disc are not head-turners, but the cinematography is, and the expanse of special features available only strengthens the package. 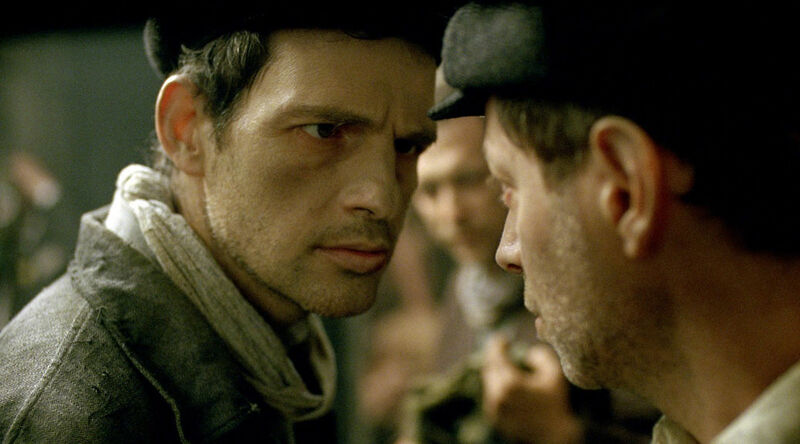 Son of Saul is one of the most memorable foreign or domestic films that I’ve seen over the past ten years, a gut-churning movie that makes a lasting impression.